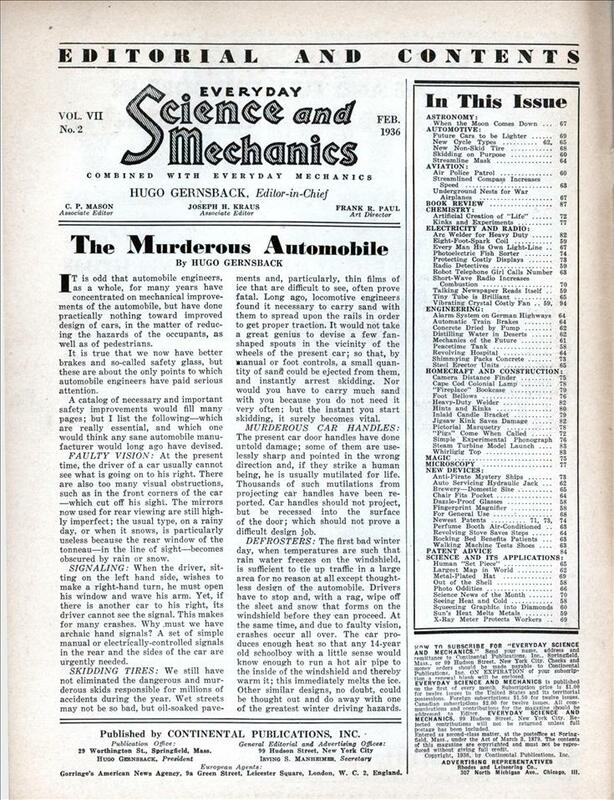 IT is odd that automobile engineers, as a whole, for many years have concentrated on mechanical improvements of the automobile, but have done practically nothing toward improved design of cars, in the matter of reducing the hazards of the occupants, as well as of pedestrians. It is true that we now have better brakes and so-called safety glass, but these are about the only points to which automobile engineers have paid serious attention. A catalog of necessary and important safety improvements would fill many pages; but I list the following—which are really essential, and which one would think any sane automobile manufacturer would long ago have devised. FAULTY VISION: At the present time, the driver of a car usually cannot see what is going on to his right. There are also too many visual obstructions, such as in the front corners of the car —which cut off his sight. The mirrors now used for rear viewing are still highly imperfect; the usual type, on a rainy day, or when it snows, is particularly useless because the rear window of the tonneau—in the line of sight—becomes obscured by rain or snow. SIGNALING: When the driver, sitting on the left hand side, wishes to make a right-hand turn, he must open his window and wave his arm. Yet, if there is another car to his right, its driver cannot see the signal. This makes for many crashes. Why .must we have archaic hand signals? A set of simple manual or electrically-controlled signals in the rear and the sides of the car are urgently needed. SKIDDING TIRES: We still have not eliminated the dangerous and murderous skids responsible for millions of accidents during the year. Wet streets may not be so bad, but oil-soaked pavements and, particularly, thin films of ice that are difficult to see, often prove fatal. Long ago, locomotive engineers found it necessary to carry sand with them to spread upon the rails in order to get proper traction. It would not take a great genius to devise a few fan-shaped spouts in the vicinity of the wheels of the present car; so that, by manual or foot controls, a small quantity of san<5 could be ejected from them, and instantly arrest skidding. Nor would you have to carry much sand with you because you do not need it very often; but the instant you start skidding, it surely becomes vital. MURDEROUS CAR HANDLES: The present car door handles have done untold damage; some of them are uselessly sharp and pointed in the wrong direction and, if they strike a human being, he is usually mutilated for life. Thousands of such mutilations from projecting car handles have been reported. Car handles should not project, but be recessed into the surface of the door; which should not prove a difficult design job. DEFROSTERS: The first bad winter day, when temperatures are such that rain water freezes on the windshield, is sufficient to tie up traffic in a large area for no reason at all except thoughtless design of the automobile. Drivers have to stop and, with a rag, wipe off the sleet and snow that forms on the windshield before they can proceed. At the same time, and due to faulty vision, crashes occur all over. The car produces enough heat so that any 14-year old schoolboy with a little sense would know enough to run a hot air pipe to the inside of the windshield and thereby warm it; this immediately melts the ice. Other similar designs, no doubt, could be thought out and do away with one of the greatest winter driving hazards. It’s interesting to see how far we’ve come with these safety hazards. 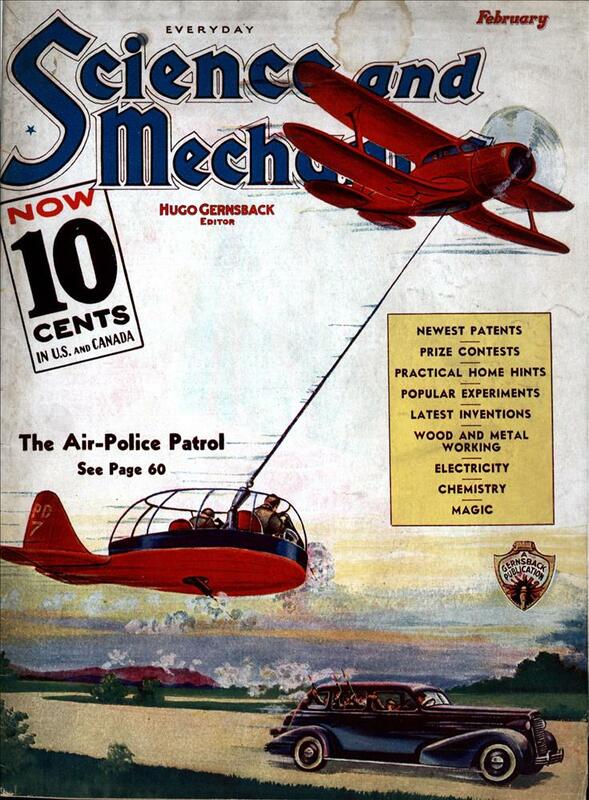 Mr. Gernsback was fairly visionary in this case, as it turns out. Faulty vision is still a difficulty, but generally improved. Cars do still have blind spots and areas; however, they’re likely not as vast, and mirror coverage is better these days. The electric rear-window defogger (and rear window wipers) and heated outside mirrors help keep the view clear in poor weather. Of course, even perfectly clear vision is only useful if people will care to look about. Skidding tires are still a problem, although significant improvements have been made in tire and suspension design so that modern cars have far better traction. The automatic sander idea is interesting, though I’m not sure how practical it would be; it would help for skids with the car going forward, but probably not for ones where the vehicle slides sideways. Some large commercial vehicles such as school busses have built-in tire chains that can be deployed when conditions warrant (without having to get out and buckle them around the wheels). Door handles are far better designed these days, and indeed inset. I suspect the primary reason is aerodynamics rather than pedestrian safety, however. Defrosters (and windshield wipers) likewise are required standard equipment and operate much as described here. It’s also interesting to consider what safety innovations have come along that were missed. One obvious example is the modern three point seat belt that apparently saves some 4000 lives a year in the US. God, this would have been horrid for cyclists. I live in a city with streetcars and winter – and they use a LOT of very fine white sand. Come spring, it’s worse than ice. Mr Gernsbach was talking about handles and knobs that were INSIDE the car. Even as late as the 50s and 60s, people were impaled by interior knobs and handles, not to mention the non-collapsible steering wheel. Today the door release handles are little flush levers buried in the armrests. Preston Tucker had go at making a safer car but met with huge resistance from the BIG 3 which drummed up an alleged charge of fraud to stop him. Good movie about him too. Cars have much worse visibility these days due to crash safety. Even in the last 10 years we have seen successive editions of the same car model increase in chunkyness year after year. Roof pillars have enlarged so much to increase strength that the visibility has worsened considerably. The sand release idea is nice. I would like to have it on my car for emergencies. The sand idea would never be practical. To be able to deploy sand in the event of a skid and ‘instantly arrest skidding’ you would need not only the lightening fast reflexes to do it before hitting anything, but also a huge amount of faith in the skinny, bicyclesque tyres to actually grip the road sufficiently to allow you to regain control.